To amend the Elementary and Secondary Education Act of 1965 to strengthen elementary and secondary computer science education, and for other purposes. Mike offers some blunt and intense advice about maintaining absolute integrity in one’s work. While he’s addressing his concerns to designers, I take his advice to apply equally well to computer programmers, UX, UI, teachers… any profession where you’re creating… and really, shouldn’t that be all professions? I’m supporting a friend with a great idea that’s a little less than 12 hours old…. My friend and fellow computer science education researcher, Brian Danielak, has worked hard today to create what we hope will be the first of many video podcasts to promote high quality visualizations in science. He and his team would like feedback ASAP on their initial effort. Whatever your personal level of achievement, it’s vital that you remember to make space for others to stand up and stand out. Here are three examples of celebrities rising to that challenge. Thank you to Christie Veitch and Brian Danielak for reminding me. Infographics have a way of bringing issues into focus (… thus “INFOgraphics”, I suppose!). American education reform seems to be stuck in a pattern of finding fault, then believing that more of the same policies that created the faults are the solution. To learn more about the source and context, be sure to read The Village Voice’s article on the outsourcing of education. My sense is that we all often throw up our hands and imagine that there’s nothing we can do, whether it be about our country or our organizations or ourselves. We should fear failure: the failure to try and the failure to behave in a moral, principled way; everything else is ego. I wanted to let you know about Apple’s new two-step verification process and give you my recommendation regarding it. Two-step verification is a security method that has become popular over the past few years as passwords, pass phrases, and security questions have become increasingly less secure. Logan’s thoughtful, well-presented talk at a recent TEDx conference reminds me just how much massified education is failing our youth. Learners need agency over their learning experiences. In this course, students develop their computational thinking skills through guided inquiry discussions. Topics such as the nature of computation, binary, boolean logic, computer architecture, networking, and programming are introduced. Students are challenged to reverse engineer programming solutions in order to explore functional decomposition and other computational concepts. Bad data is a fact of life. Coping with bad data is a valuable, learned skill. Bad Data Handbook offers insights from over 20 authors based on their years of personal experience managing ill-defined, often chaotic and incomplete data. We begin with a exploration of what is meant by *bad data* and what checks we can preform to help us understand data quality as a prerequisite to data analysis. Kevin Fink offers suggestions on approaching data critically in order to ensure that we understand what we’re working with before we begin to try to manipulate it. Fink offers useful scripts in shell and Perl that can be used to inspect data and perform basic sanity checks. Paul Murrell tackles the problem of scraping data from sources formatted for human consumption into a format more amenable for algorithmic analysis using R. And on and on. Each chapter addresses a critical concern in the data life-cycle: identifying, annotating, capturing, archiving, versioning, manipulating, analyzing, and deriving actionable information from imperfect or incomplete data. The advice offered is both powerful and immediately useful to data scientists and newcomers to the field alike and for me has spurred several ideas for how to approach teaching statistics. Given the number of authors who contributed to this volume, it should come as no surprise that the tone, writing styles, and tools used vary greatly among the chapters, sometimes wandering into technical minutia, but only infrequently. The book holds together remarkably well, regardless, and was a pleasure to read. Many of the writing projects I take on involve the creation of a timeline graphic. Such timelines can be quickly created using nothing more than a spreadsheet and some clever formatting tips. Listening to Pandora tests me. Their algorithm seems to be that whenever they detect that I’m listening to a song I like, they should visually or aurally interfere, thus creating the most agitating experience possible. This evening, before I logged in, they began playing a song I like, but a version I hadn’t heard before so, to fully appreciate the music, I paused it to grab my headphones. 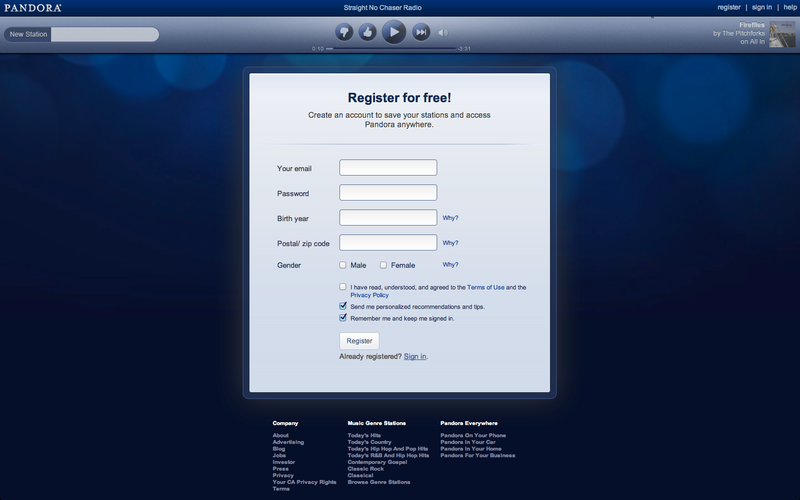 Of course Pandora made it impossible for me to listen to the song by modally forcing me to login (#fail). Unfortunately, their login routine isn’t sensitive to what you were listening to immediately prior to login, so they just start playing something new and different (#fail). Don’t get in the way of the user enjoying the experience. 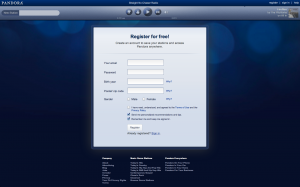 If the user is already listening to a song on Pandora, but not logged in, then immediately after login begin playing the same song. In this short video, Dr. Steven Strogatz– a Cornell Mathematician– reminds us that the student-teacher relationship is complex, dynamic, enduring, and often unpredictable; far from the Brave New World-style cold, isolationism espoused by the so-called professionalization of education that the United States has experienced over the past 100 years. Bret offers some interesting insights into the importance of immediate, direct feedback while learning to program—really, while programming at all in his CUSEC talk from early 2012.
to keep a copy for myself and to email (or post to a course management system) for the author to review. Unfortunately, OSX doesn’t have a built-in keyboard shortcut for Save to PDF…, but it’s easy to add one. This 70-minute lecture by Charlie Kaufman— Eternal Sunshine of the Spotless Mind, Adaptation, Being John Malkovich— on screenwriting applies equally well, I think, to being an educator. Consider the following excerpt, but replace screenplay with learning– for the student perspective– or even teaching! A screenplay is an exploration. It’s about the thing you don’t know. To step into the abyss. It necessarily starts somewhere, anywhere, there is a starting point, but the rest is undetermined, it is a secret, even from you. There’s no template for a screenplay, or there shouldn’t be. There are at least as many screenplay possibilities as there are people who write them. We’ve been conned into thinking there is a pre-established form. While I sometimes found it difficult to distinguish quotations from his original thoughts, I found both to be engaging and inspiring. HTML5 introduces the ability to cache content client-side so that often-used resources can be used without re-downloading them. This also enables a site to be viewed from the client when no network connection is available (i.e., offline viewing of the site). Create a plain text file listing all of the resources that should be cached by the user agent (e.g., a web browser)– the cache manifest. Refer to that file in the opening html tag of every page that will use cached resources. Regenerate the cache manifest any time you change the files in your site. Once everything is setup properly, you can visit the site using your favorite web browser. Then, to test whether the caching has worked, you can turn off the network connection to your web browser’s computer and try reloading the page.